Last year I worked with my pals at Asterisk Animation on a documentary about the Buddha for PBS. Mostly I did monsters and demons (of course). Please note - I didn't design anything here. The design was by Marina, a lovely Croatian. Lots of talented folks worked on it and you can see my bits below, or wait until April 7th when you can watch it on the telly. Carolyn Green did the stuff from 2:41 and then I linked it my my section from 3:37 - 4:28. I also did the compositing from 4:37 and designed the short sequence from 5:00. In this clip, I the compositing and all the demons to 1:07. I also composited this beautiful scene at 2:47. The scene was a collaboration between several of us, and I was particularly pleased with the birds I created. Who outside of Australia knows Norman Lindsay? 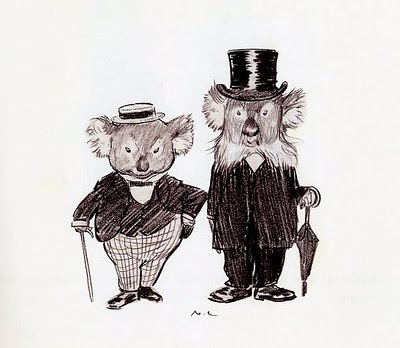 Norman was a sometimes controversial Australian artist. 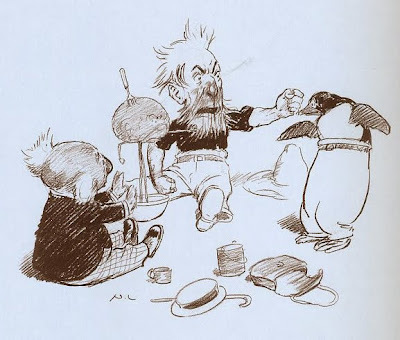 He painted, created etchings, sculpted and was also a cartoonist. 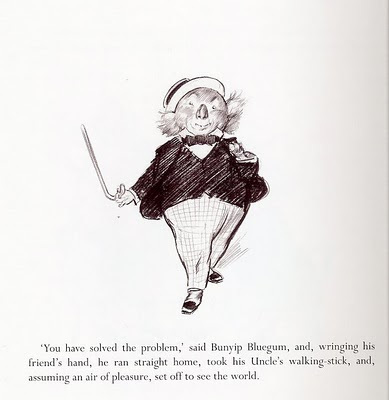 He wrote and illustrated a single children's book called The Magic Pudding. 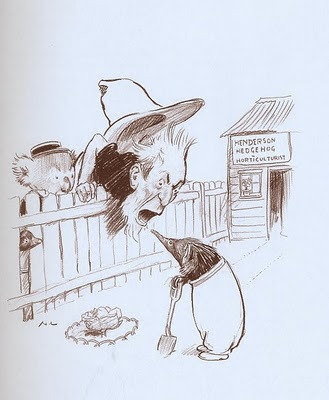 It's the very Australian equivalent of something like Winnie-The-Pooh. Several years ago a collection of dunderheaded simpletons got together to make an animated feature out of this classic book and produced exactly the kind of pap that you can easily imagine dunderheaded simpletons producing. The book is full of well established, well designed characters ripe for animating. There's a simple, fun story that's broken up into four chapters (or slices as they're called in the book). All the elements are sitting there. All it needed was a strong hand to guide it through. But it didn't get that. They took the amazing, AMAZING drawings and make kaka from it. Anyway. I'm sure I've bitched about this film before on here. I have scanned a small handful of the illustrations below. 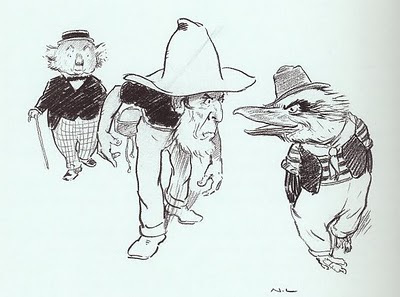 I present them to the world and offer an apology to Norman Lindsay. Show your friends and tell everyone to buy the book from somewhere. 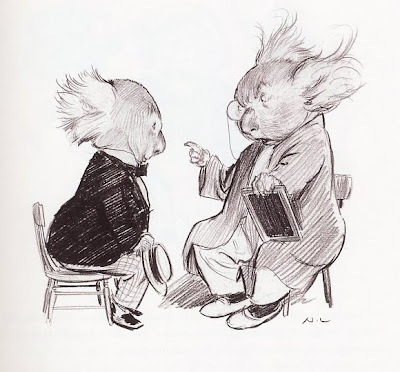 The fellow on the left is the main character - Bunyip Bluegum. 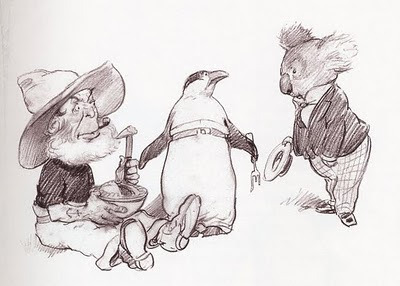 The guy in the top hat is his conservative uncle, Uncle Wattleberry. A bunyip is a mythical Aboriginal creature and both bluegum and wattleberry are trees. 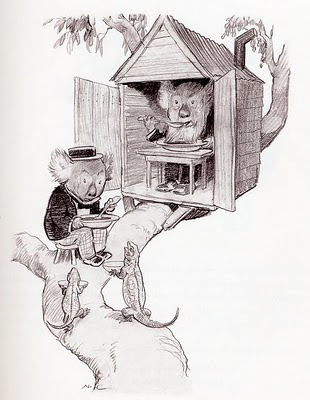 Bunyip and Wattleberry share this little house. Bunyip is prompted to leave the house because he's tired of finding his uncles whiskers in the soup. 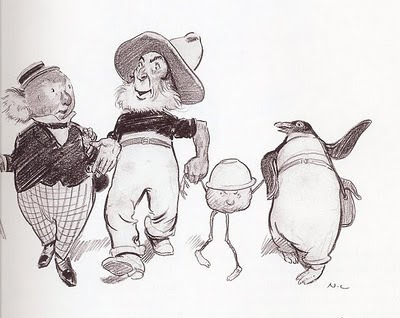 Bunyip leaves home and meets Bill Barnacle and Sam Sawnoff (the penguin). The have a magic pudding. Using a magic trick the pudding can be whatever pudding you like - steak and kidney, rum raisin. Anything. You cut a slice an it grows back. The pudding is called Albert and he's a very, very bad mannered rude feller. 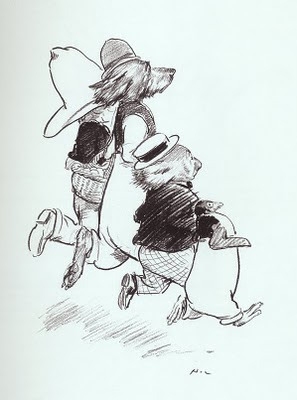 Bill and Sam are constantly on patrol because puddin' thieves are always trying to steal Albert. Bunyip rallies his new friends and they form the Puddin' Eaters Appreciation Society (or something like it). Each chapter revolves around the puddin' theives trying to steal the puddin' and the puddin' owners retrieving it. 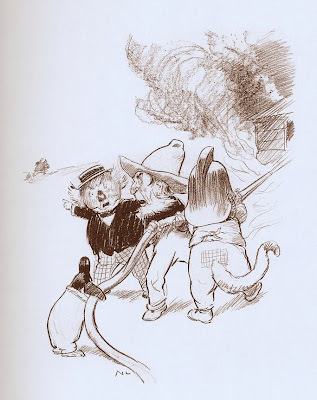 Here, the thieves start a fire and get the heroes to come help them while someone makes off with Albert. This is Albert standing up in his bowl. There's been some horseplay and Sam has accidentally shoved Bill's face into the pudding. 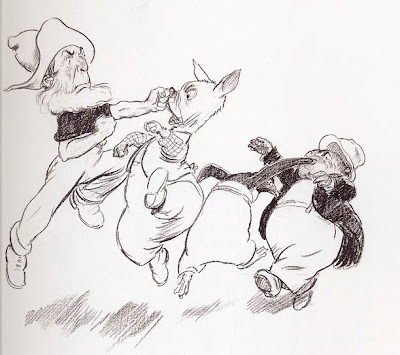 One thing the book is full of is FIGHTING! Here, the heroes pummel the thieves. 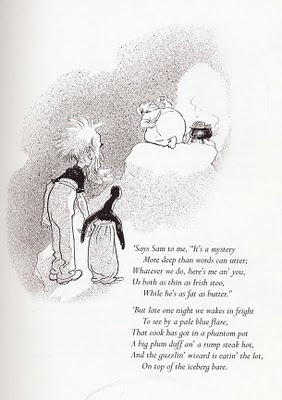 Here, Bill and Sam tell the story of how they found the puddin'. In short, they were shipwrecked (they were both sailors) on an iceberg with the ships cook. As they got thinner, he got fatter. They discovered Curry and Rice (the name of the cook) was surviving on the Albert and wasn't sharing a crumb of it. They throw him off the iceberg to his death (yeah!). The fellow that Bill is shouting at is an echidna, although they call him a hedgehog here. 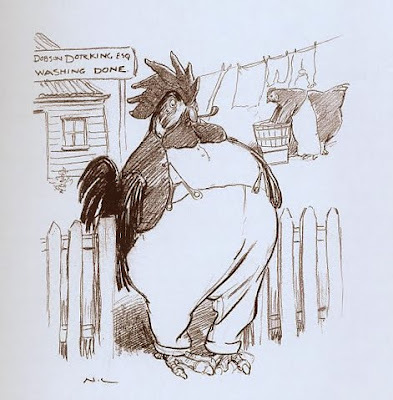 A big blustery rooster that is surprisingly like Foghorn Leghorn in his dialogue. In the third chapter they come across a market gardener - a dog called Benjamen Brandisnap. He joins the society of puddin' owners and helps them through the last chapter and a half. 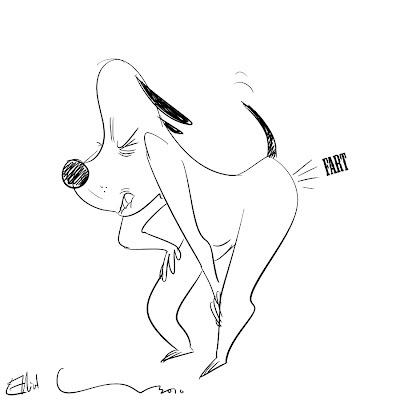 Below is my favorite drawing in the whole book. 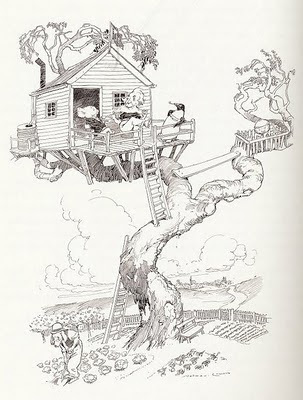 In the end, after all the fights (including a punch up at the end of a court scene) they all go live in a tree together. Note that Albert is sulking in his puddin' paddock. Someone from Tauranga has been visiting my blog regularly. I know nothing of Tauranga other than it's the town that Wal Footrot plays rugby for. Anyone wanna put their hand up?